I admit that I am the old guy on this site. I grew up in the era when George Steinbrenner was King. If you wanted the best baseball player, you went and bought him. The impulsive side of me loved those days. Who didn’t want an All-Star at every position? But there was a price to be paid. 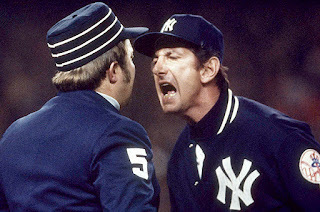 I loved Billy Martin as Yankees manager. I was excited with every hiring and devastated with every firing. Managers, General Managers, and Pitching Coaches seemed to change more often than Lady Gaga’s outfits and hairstyles. Maybe I’ve always been able to adapt well to change because that was my childhood. There were no constants in New York other than The Boss ruled supreme. I became a Yankees fan on December 31, 1974. It’s a day that I’ll never forget. I had grown up rooting for the Oakland A’s and their collection of characters. My favorite pitcher was Jim “Catfish” Hunter. The earliest books I remember reading were about baseball. I think the very first biography I read was about Ty Cobb, but it was a subsequent biography I encountered about the legendary Lou Gehrig that laid the foundation for a lifetime of Pinstripe Passion. So, it seemed meant to be when Catfish Hunter became a free agent and signed with the Yankees on New Year’s Eve, 1974. That day, I went with him to New York and I’ve never looked back. The Yankees lost that day, 5-3 to the Cleveland Indians. They finished third for the year with a record of 83-77, 12 games behind the Boston Red Sox. By the end of the season, Billy Martin had taken over as the Yankees manager (for his first time). It was a great time to be a Yankees fan and you could sense that something bigger was developing after a decade of apathy under CBS ownership. By this time, Steinbrenner had owned the Yankees for a couple of years but his influence was starting to grow. I’ve always loved the quote by then Yankees minority owner (and later Houston Astros owner) John McMullen when he said “There is nothing in life quite so limited as being a limited partner of George Steinbrenner”. However, the Yankees desire to field the best collection of players came at a heavy cost. It was hard to watch a talented young pitcher named Doug Drabek get traded to the Pittsburgh in 1986 (for Rick Rhoden) and later win the NL Cy Young Award for the Pirates. It was hard to watch young slugger Jay Buhner crush minor league pitching, only to get traded to the Seattle Mariners for a long and productive career (for the forgettable Ken Phelps). It was hard to watch Fred “Crime Dog” McGriff get traded to the Toronto Blue Jays for a marginal reliever named Dale Murray. I loved when Al Leiter first came up. There were growing pains associated with a young starter, but you could tell that he was going to be a good one. Yet, he ended up getting sent away to Toronto for Jesse Barfield. Leiter would go on to win three World Series championships with other clubs. This list goes on and on, but it is very difficult to get excited about young prospects, only to watch them flourish in other organizations. I’ve read the blog comments that the Yankees need to get creative. I couldn’t agree more. A few years ago, the Boston Red Sox looked like they were saddled with age and bad contracts. Then, in one trade late in the 2012 season, they eliminated the contracts of Adrian Gonzalez, Josh Beckett, and Carl Crawford. It doesn’t really matter what they got in return. The trade freed valuable dollars and put the Red Sox on the path they are on today with one of the better teams in baseball. When they needed a frontline ace (Chris Sale), they traded their best hitting prospect, Yoan Moncada, perhaps the best prospect in all of baseball, and their best pitching prospect, Michael Kopech, who looks to be a future ace. Time will tell if this move backfires, but they are doing something. I want to win now. But the realist in me recognizes that it is not yet our time. The moves today must set up the team for success in 2018 and 2019. There can be no short-sighted moves. Many teams load up for the chance at single championships. If the Yankees play their cards right, it could set the team up for another multiple run. We may never see a run like the 90’s (or 50’s) again, but try telling the New England Patriots that parity has been achieved in the NFL. I am in favor of making the necessary (and creative) moves necessary to build sustained success. But for the quick fix? Those days are behind me. "The moves today must set up the team for success in 2018 and 2019." This is why I fear making any big trades. When I say "big" I mean trades involving Frazier, Torres, Judge, Kaprielian, etc. A deal involving those guys could net the Yankees their ace starter for the future, while they spend huge on Manny Machado and Bryce Harper, but those past trades you spoke of make me scared of doing so. While I am enjoying clam strips & cold beer, I agree with you both. I do get impatient, but I think I'm rational.